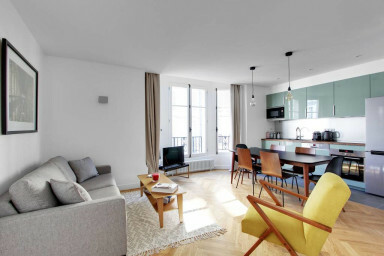 Superb & trendy 70sqm two-bedroom with two-bathroom apartment, for up to 6 people, in the outstanding Saint Michel area, few meters away from Notre Dame. 2 large bedroom with a queen size bed, two bathrooms, a top quality sofa bed and a fully equipped kitchen. The apartment also offers a lot of storage. Located in a very nice building with 2 security doors. TV, wifi, line and towels are provided. This is for family or friends, the place to be to enjoy the City of Lights!